It is visually striking. That wavy road grabs attention, and the rest of the art is equally well-done. I really like how the wave in the road represents the shockwave of traffic effect. Cool as it is, there aren’t exactly mind-boggling conclusions here. The point made about the funnel effect makes sense, and is interesting, but there isn’t that much to it. Still, it’s well made and fun to look at. 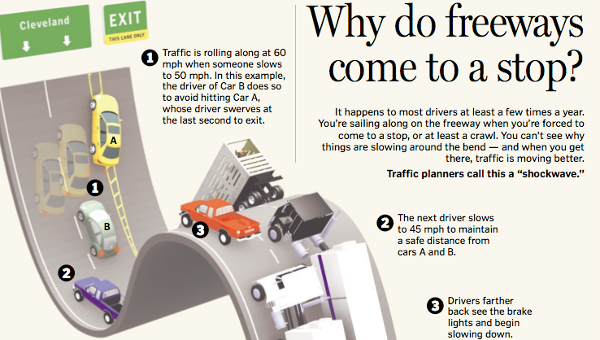 The infographic has circulated the web, but never from its true source at a large Ohio Newspaper, The Plain Dealer. Here’s the original PDF file. This entry was posted on May 31, 2010, 9:00 am and is filed under Society & Culture. You can follow any responses to this entry through RSS 2.0. You can leave a response, or trackback from your own site. I found this one quite interesting. 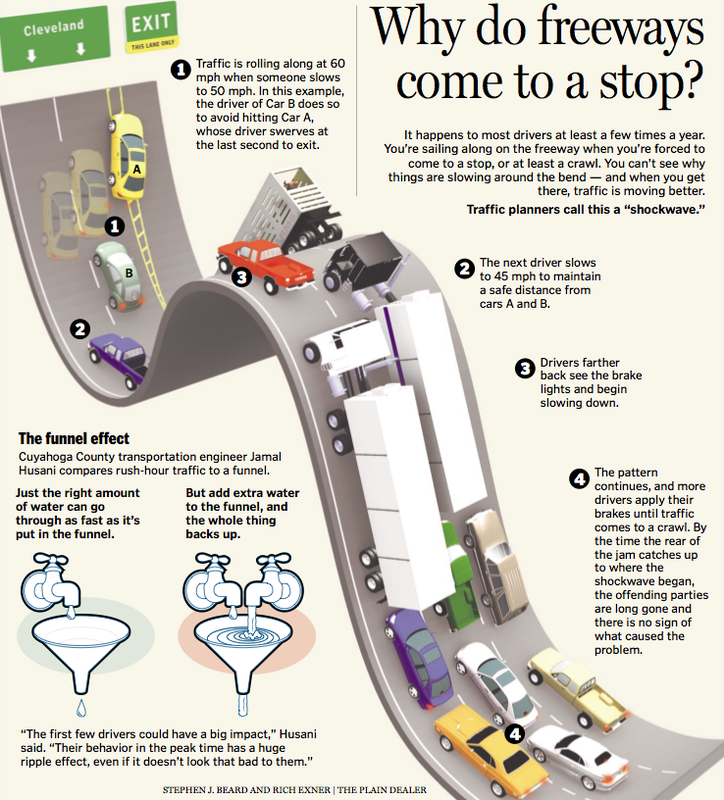 Like you said, it doesn’t really point out anything particularly groundbreaking about traffic jams, but the graphic is nice to look at. It does do a good job of describing the ‘shockwave’ effect with a typical scenario that we all can relate to. It makes sense… which may have been they’re purpose. As mentioned, this isn’t really earth shaking stuff. But the graphic is nice to look at and pretty eye catching. People do this for a reason.Also, some people accelerate at different speeds, some to save gas, others because their cars are just bigger and can’t jump ahead like others cars do– some people have their minds on other things and are 2-3 seconds late on going forward.